These wetsuits are incredible, not to mention that board spray! I’m saving up for some of these babies. I’m so happy to have found that designers are collaborating with sports brands to create some chic surf wear! While browsing magazines at the hair salon yesterday, I spotted this adorable Roxy x Cynthia Rowley wetsuit. 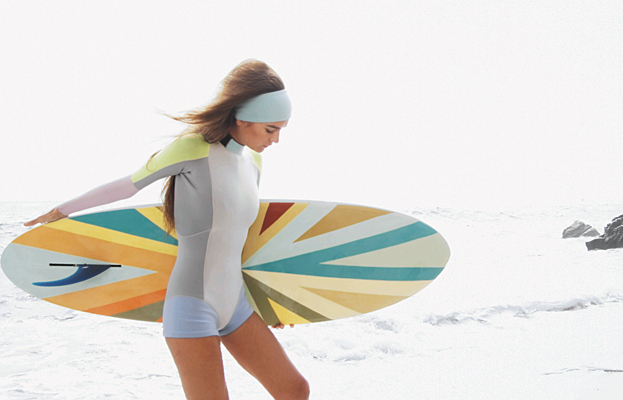 More great news: she designed a whole collection of chic, colorful, and stylish surf wear! My typical black wetsuit and white rash guards are definitely not cutting it. Even though my surfing isn’t up to par, at least I can look good while I flail in the water! Photo credits: InStyle, Refinery29, Be Sportier, Rising Hollywood.